I can’t say this summer has been the most comfortable for me. My favourite season growing up was always summer, but I have to say, I must be getting wussier in my “old” age when it comes to the heat because over the course of the last few months I have been constantly ducking under trees, storefront awnings, and every cool, shady spot imaginable. I have only gone hatless one day this summer and I have come home in a gross, sticky mess almost every day. Even though my body is begging for the cooler fall temperatures, I have to admit that this has been one very fun foodie summer. I’ve been able to tuck away over 10 farmers’ markets under my belt, I’ve been able to take some beautiful photos around the city sans the snow slush, and I’m really proud that I took advantage of my time post-graduation to make this summer mine. I haven’t had a summer to myself in the last seven years and it has felt amazing doing so many of the things I set out to do before the summer started. 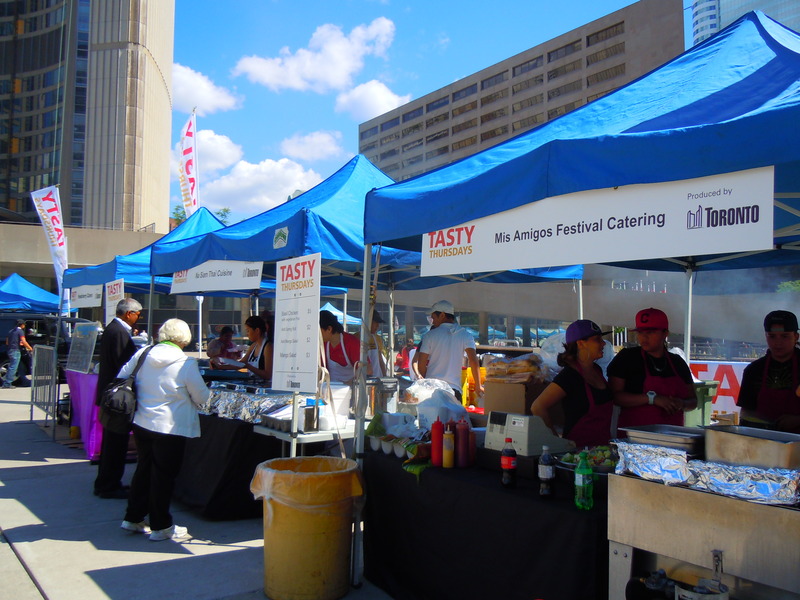 With the temperatures as sizzling as they are, summer is far from over but it’s worth taking note that Nathan Phillips Square’s Tasty Thursday outdoor food fests are coming to a close on September 1st. 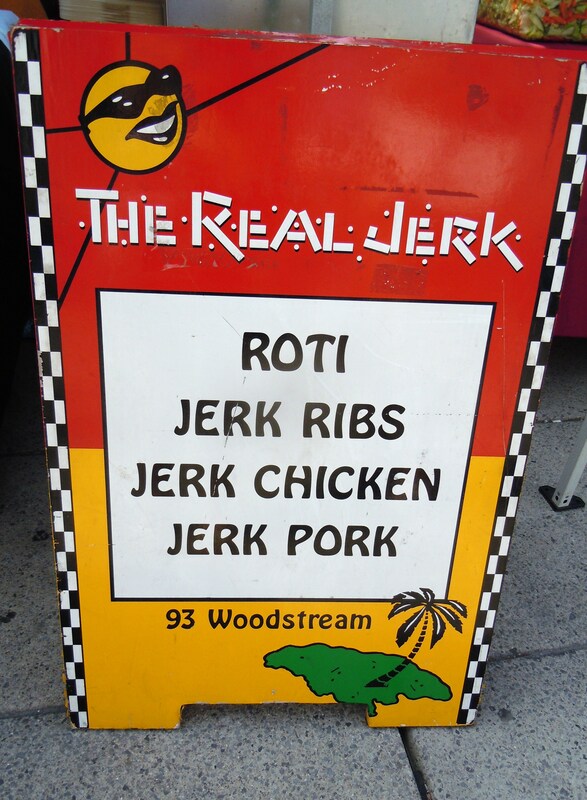 This leaves us with two more weeks of hot-off-the-grill food for lunch in the heart of the downtown core. 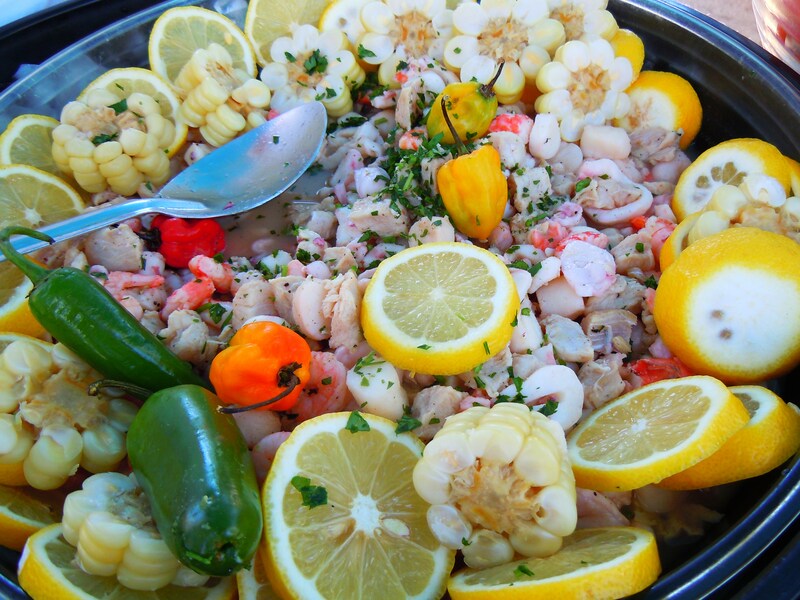 We have two more weeks to savour the flavours of seafood ceviche, jerk chicken, Peruvian rice, vegetarian pad thai, Indian dishes bursting with chickpeas, and plenty of others. 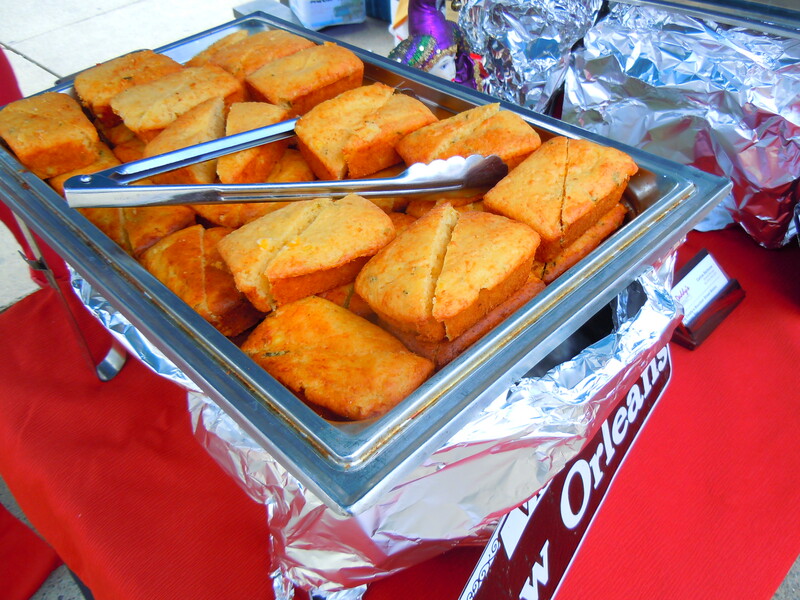 Last week Tasty Thursdays switched things up a little and we saw the introduction of Big Daddy’s Bourbon Street Bistro and Oyster Bar, Lone Star Texas Grill, and several others. You know what that means – new photos! My mum took advantage of the Southern cajun style catfish and creole rice with her fish and rice dish, and I ogled the cornbread for what seemed like eons before deciding that I would pass solely based on price. 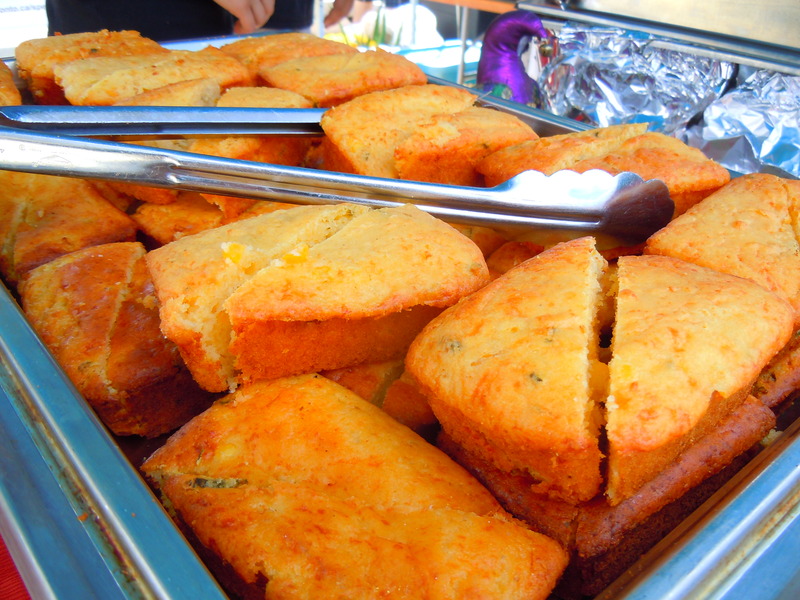 The cornbread looked fantastic, but since I wanted more than just the cornbread without wanting to go over the $5 budget threshold, I sadly walked away last week. Trust that if it comes back this week I just might cave and get me some! 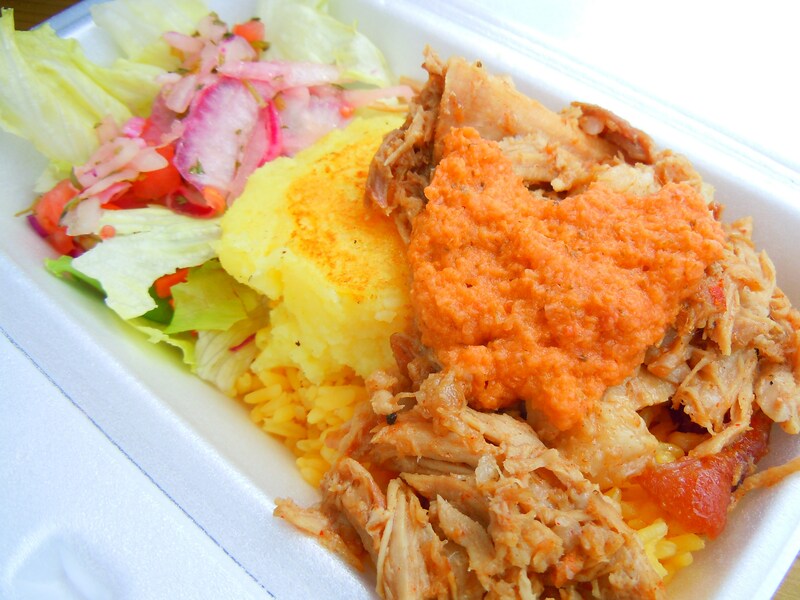 What my brother and I ordered for lunch that day came from La Fiesta Catering: pulled pork with mashed potatoes, rice, and salad. 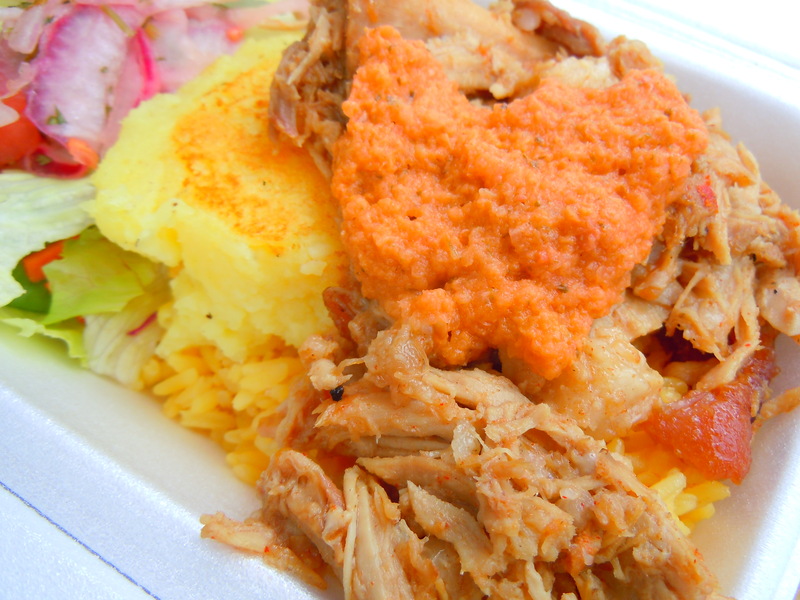 If you’ve read my Tequila Sunrise post, you know that pulled pork is a bit of a weakness of mine. So as I soon as I saw the $5 meal posted on the menu board at Tasty Thursday last week, I was all over it. The slow-cooked shredded tenderness of the pulled pork drove that weakness of mine crazy, and they had this great sauce to go along with the meal as well. And you all know how I feel about sauce! Cue Homer Simpson-like drooling here. Even though I love the pulled pork at Tequila Sunrise best, the pulled pork I had last week was great too, and the salad that came with the meal had this nice sweet tang from some of the pickled vegetables. If you can believe it, the mashed potatoes were FABULOUS! This is not your typical lump of mashed potatoes. For one thing, they have this pretty light yellow colour. And for another they have this ultra smooth, melt-in-your-mouth texture that can only be described as the love child between potatoes and corn meal. 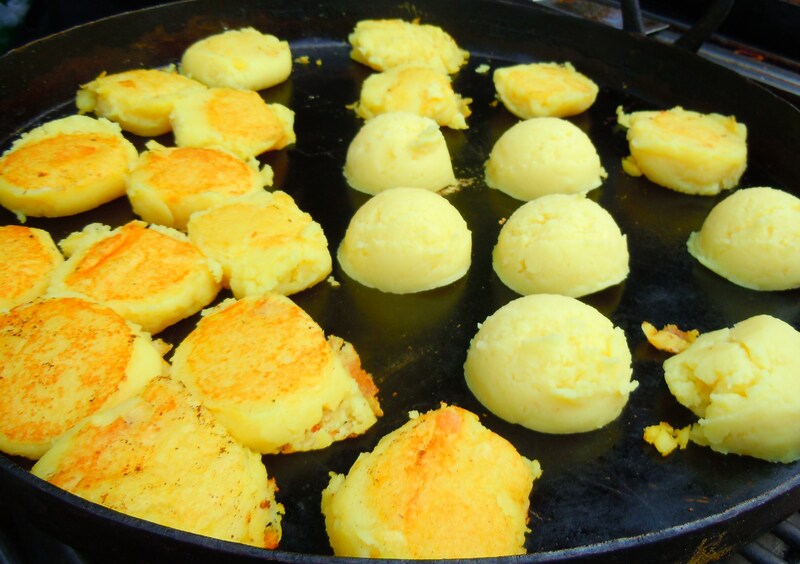 These mashed potatoes were scooped into large round domes and placed on a super hot grill to get that warm golden brown colour on the underside, as well as that little bit of crispiness. 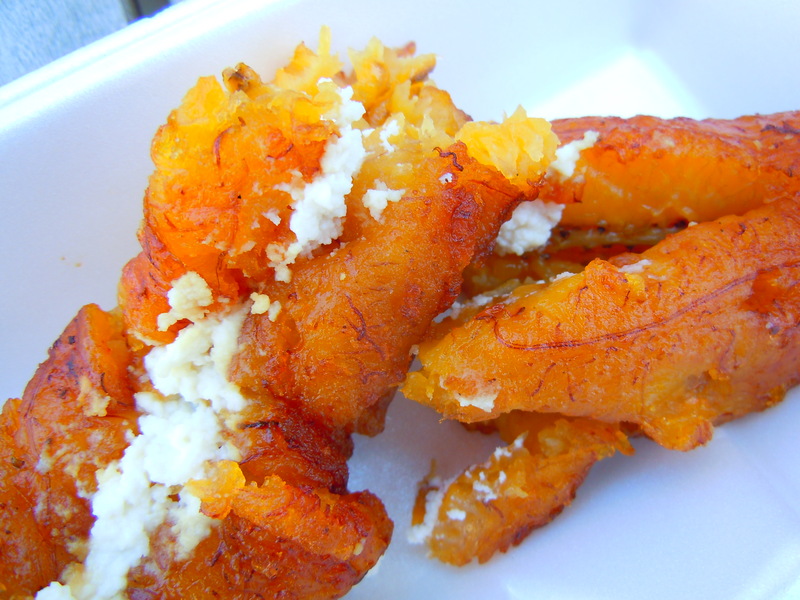 Looking at these photos now, I would seriously go back and grab a whole box full of scooped cornmeal-like potatoes and have myself a field day. 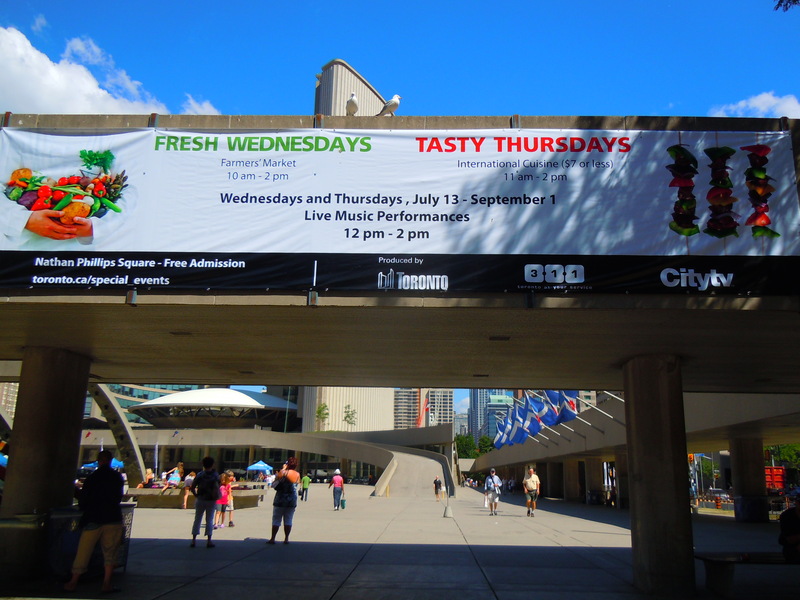 Nathan Phillips Square is located at 100 Queen St. West at the intersection of Queen and Bay St. Tasty Thursdays takes place every Thursday from 11am-2pm from July 14th-September 1st, 2011. All food items are $7 or less. For more information on which restaurants and vendors are participating this summer, click here. Yesterday was wonderfully warm, sunny, and finally, it was a day that wasn’t unbearably hot and humid. 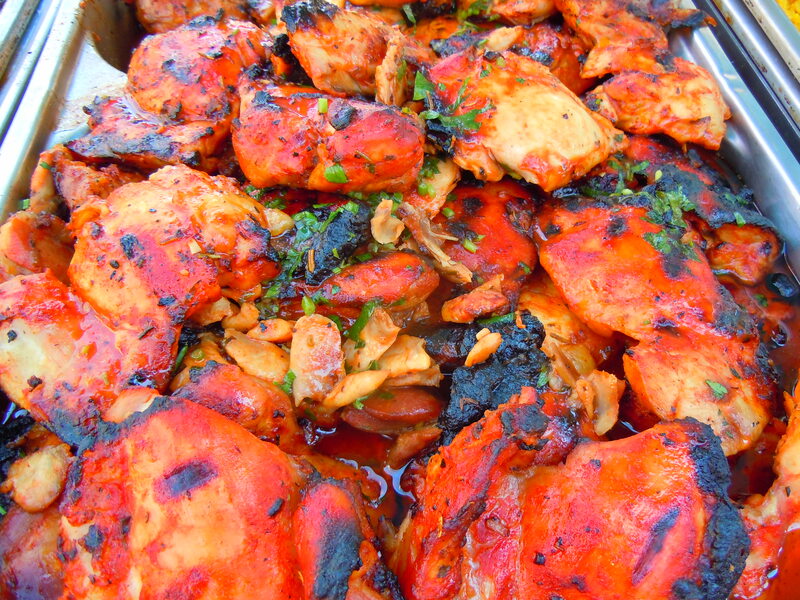 In other words, a PERFECT day for a summer lunch out at Tasty Thursdays! After a great lunch opener during the summer foodie festival’s first week in July with my chickpeas, rice, and salad, it was high time I made my way back for another meal. It’s not every day you get to eat out in an open air setting and it’s not every day you get to buy lunch without paying tax on it! I know, how sad, right? The sun is shining, I have some great food at my fingertips, and what I am most jubilant about is not having to pay tax on my food. It really is a selling point! 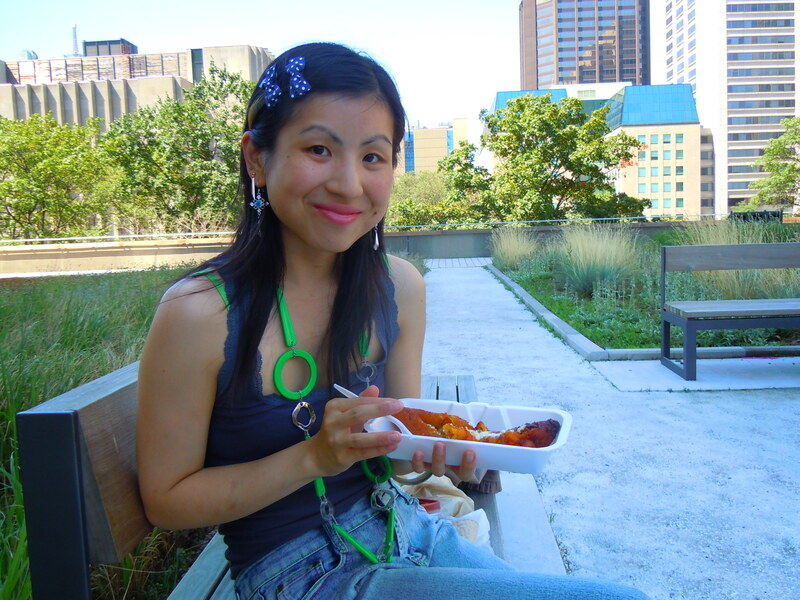 Anyway, I strolled into Nathan Phillips Square at lunchtime with two goals in mind: 1) grab a vegetarian lunch like the first time, and 2) eat on the Nathan Phillips Square/City Hall rooftop garden. Lucky for me, I accomplished both! 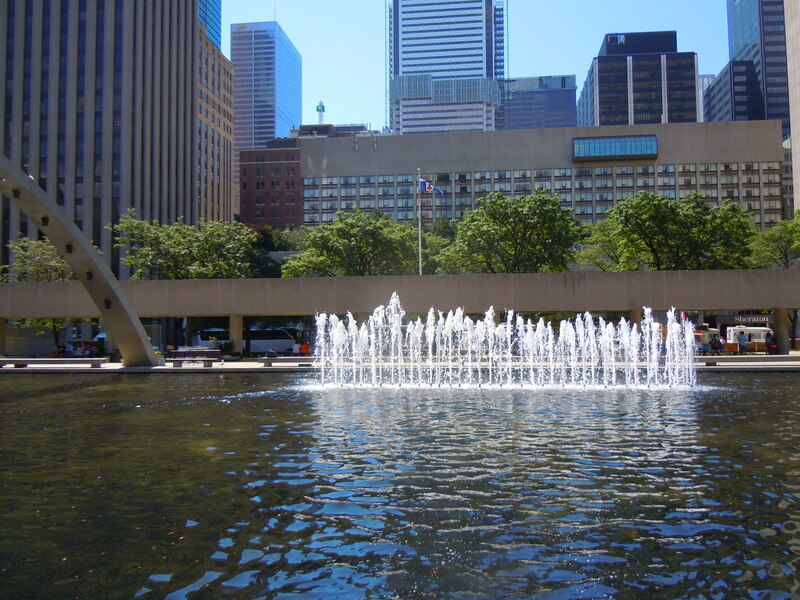 There are several things I really enjoy at Nathan Phillips Square. I love the fountains with the arches overtop and I love how the pond with the fountains is converted into an outdoor ice rink in the winter. What I love most about this iconic space in Toronto though is not on ground level, but rather, somewhat up in the air! It’s the rooftop garden surrounding City Hall (accessible from the ramp leading up to City Hall in Nathan Phillps Square on the east side of the grounds), a wonderful green space with flowers, grasses, and benches in the shade and in the sun for people to either sit out and soak up some rays, or to seek some refuge from the blazing hot weather in the breezy areas with plenty of peaceful shade. It’s not the only one in the city, but it’s in such a bustling part of town that it really serves its purpose: to provide green space in an otherwise urban area. For those who are interested in other rooftop gardens close by, there’s a beautiful one at 401 Richmond St. West with flowers, herbs, planters, hanging baskets, and tables and wooden benches. I went to the one on Richmond St. for the first time during Doors Open at the end of May and I fell in love with it. It’s the juxtaposition between industrial and urban landscapes with peaceful, green spaces that make these areas so special and so interesting. If you’re looking for a little respite from the everyday grind, these are great spaces. 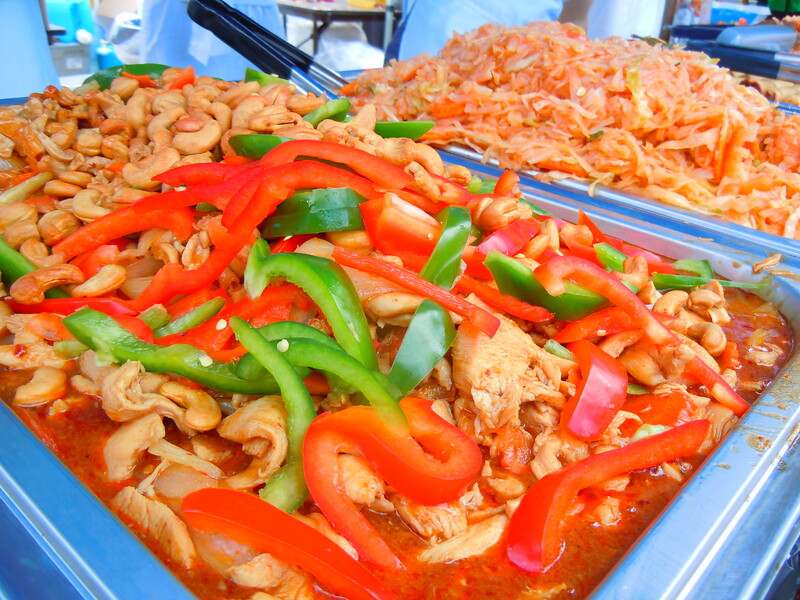 Grab some lunch (at Tasty Thursdays, for instance) and enjoy the scenery! Aside from the photo of myself with part of the rooftop garden in the background, I don’t have photos for you all right now (I really didn’t want to capture people eating in the background! ), but I promise to have some next time. Trust me when I say though that this is an urban oasis, a gathering place for those who want a comfortable place to eat lunch, and for those who want some solitude to read a book. I love it. 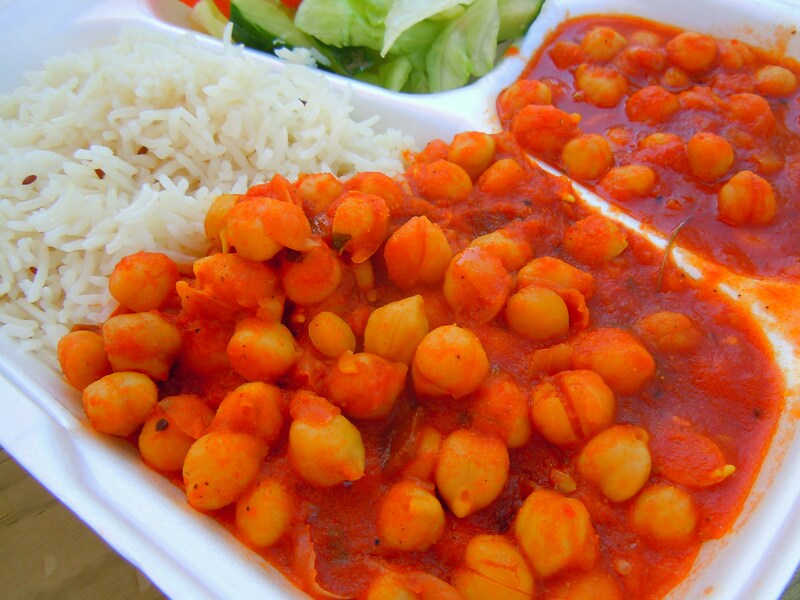 A Look at This Summer’s First Tasty Thursday at Nathan Phillips Square – Channa and Rice! I wasn’t sure what the arrangement would be this year. Would all of the participating restaurants be there every week? Would they take turns? Not all of the participating vendors were present last Thursday, so I’m assuming this just means that the vendors are operating on a rotating basis where some will be there every other week, as opposed to every week, during the duration of the event. If you’re dead set on grabbing lunch from one particular vendor, this set-up may not make it easier for you, but I actually really like it as it ensures that there’s a different combination of eats every week. It was really fun jogging from booth to booth seeing the metal trays and bowls being filled with food, snapping photos of said mountains of food (a thank you to everyone who let me snap away! 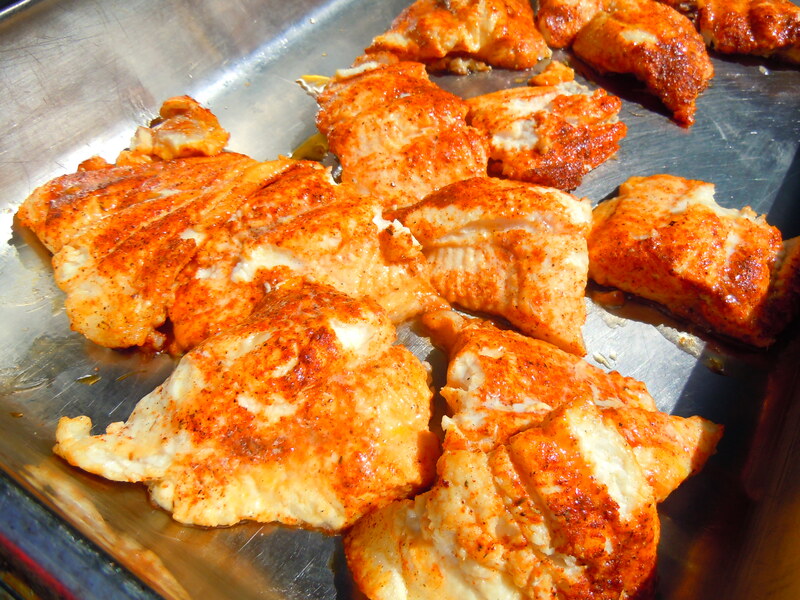 ), and hearing the sizzling sounds of grills being fired up. 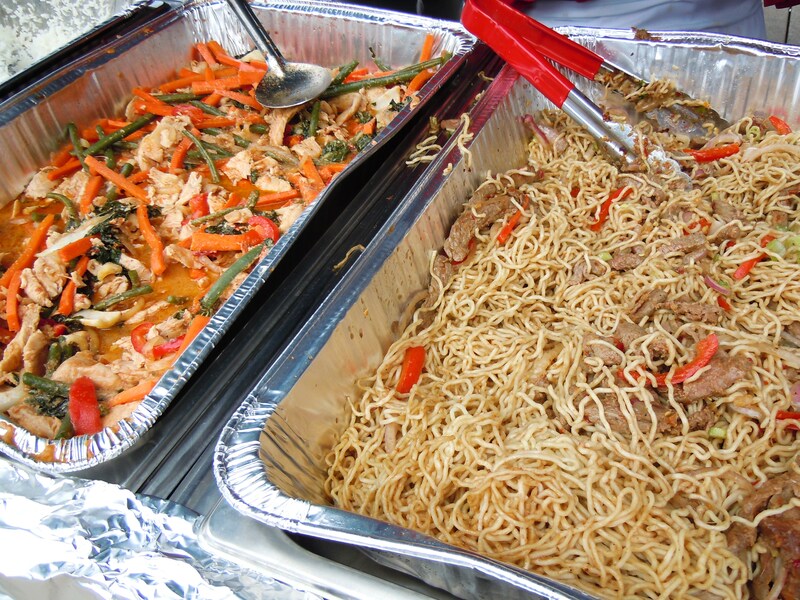 There were Caribbean jerk chicken sandwiches, Chinese pork and beef ball skewers, dumplings, Thai mango salad and vegetarian pad thai, Indian butter chicken, and a host of other dishes. 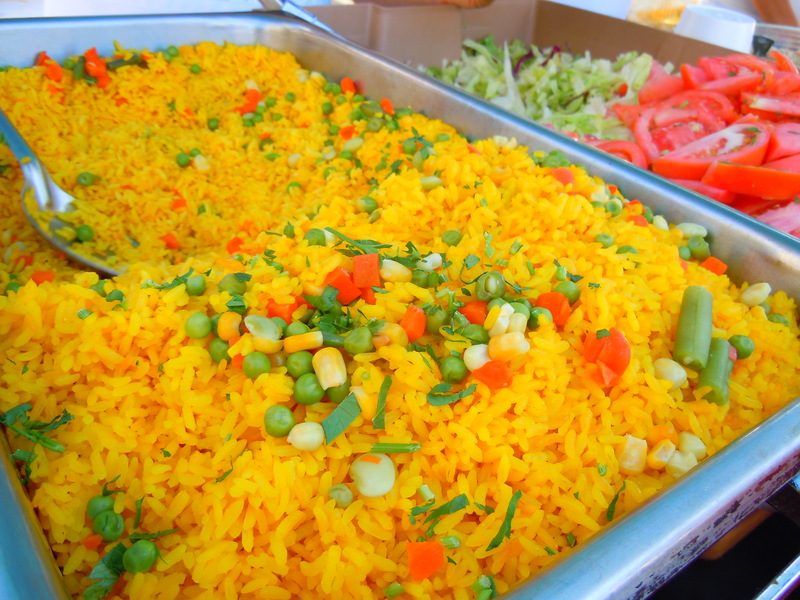 If you’re looking for vegetarian options there are certainly a number of meals to choose from, but I’d say that the options might feel a bit limited depending on which vendors are there during a particular week. 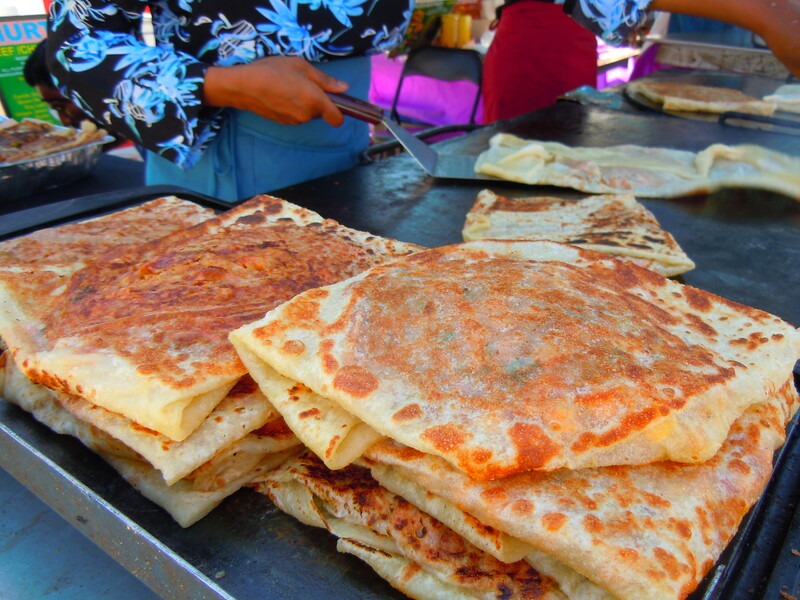 Most of the vendors have one or two vegetarian options, so even though the choices aren’t exactly endless, I’d give the event a look-see regardless. I sure enjoyed my vegetarian meal of channa and rice last week and I’m curious to see what the other restaurants have to offer. I’ll definitely write out a list of veggie options and report back the next time I go. I know with so many options it can feel a little overwhelming, but after giving the vendors a quick once-over, you start narrowing down your choices really quickly. 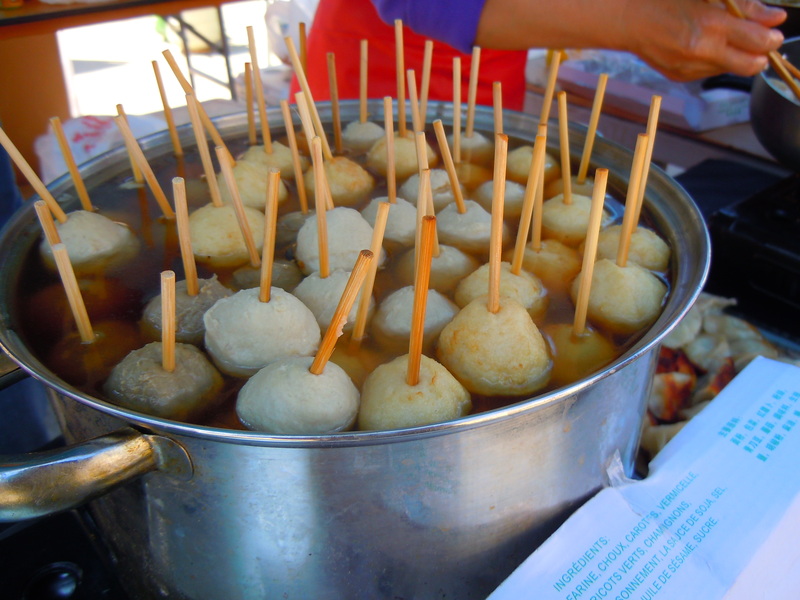 It boils down to what you feel like at that moment and how hungry you are and for me, these feelings change on a regular basis so I never rule out a specific vendor for the entire summer. So, onto my process of elimination! I rarely eat burgers now, so I automatically eliminated that route. I didn’t feel like anything particularly meaty, so I passed on the Caribbean jerk meat and the Greek souvlaki, pork, and gyros. 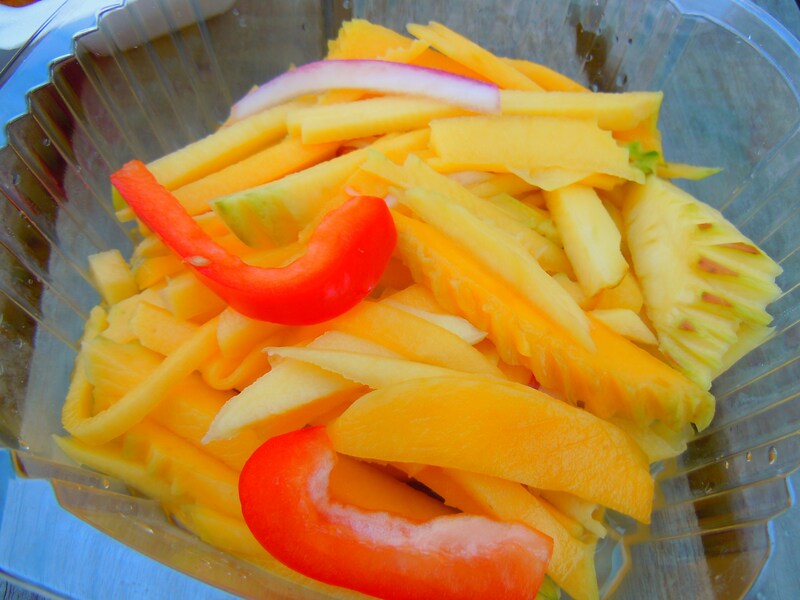 My tummy wasn’t craving anything Chinese or Thai that day and although the Peruvian food was calling my name, I wanted to try something I hadn’t already tried last summer. After some careful consideration and a lot of running back and forth between vendors, I chose the channa and rice meal with salad from Kathmandu’s as my first Tasty Thursday meal of the summer. And I’m really glad I did! Their channa and rice meal was priced at $5 and I got bang for my buck with this one! 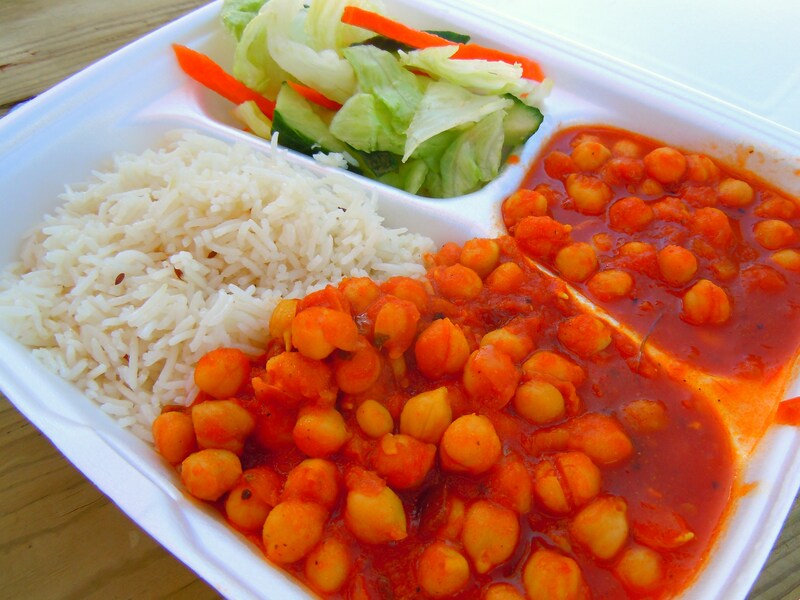 I was given a large square container with basmati rice, a green salad with lettuce, cucumber, carrots, and green bell pepper, and heaping spoonfuls of hot chickpeas smothered in sauce that tasted like a mixture of tomato, cream, and spices. I’m not sure what the combination of spices were in the channa, but I’ll find out the next time I go. 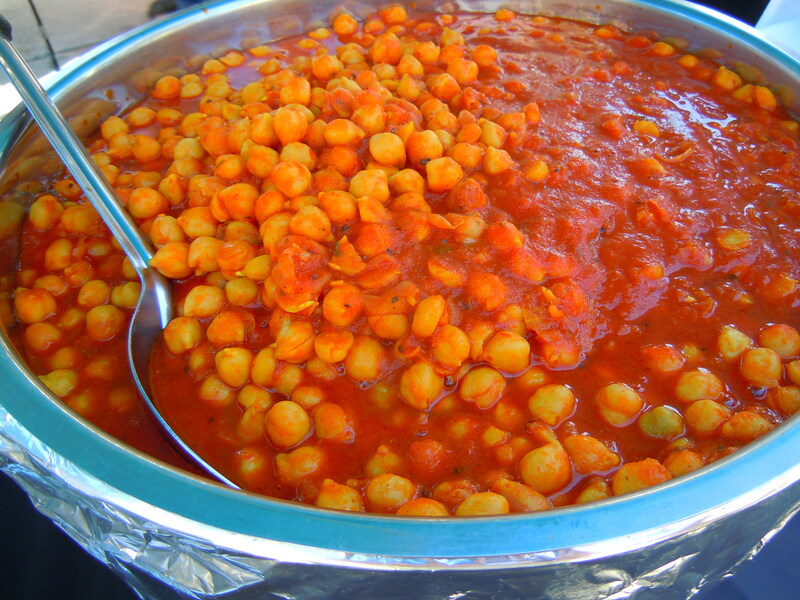 The channa wasn’t overly spicy and the level of heat was perfect. There was just enough kick to make it really yummy and even my brother, who has a low tolerance for spicy food, really liked it when I gave him some to try. I really wouldn’t worry about the spiciness with this meal as they give you plenty of rice and salad to tame the existing heat and to mop up any extra sauce. The chickpeas were tender, the rice was soft and fluffy, and I even thoroughly enjoyed my salad (I know, it’s just salad!) which was fresh and crunchy. Even though I lamented at the fact that they raised the maximum price point for certain items from $5 to $7 this summer, this was definitely a great kick-off and I’m really looking forward to trying out a bunch of other dishes! 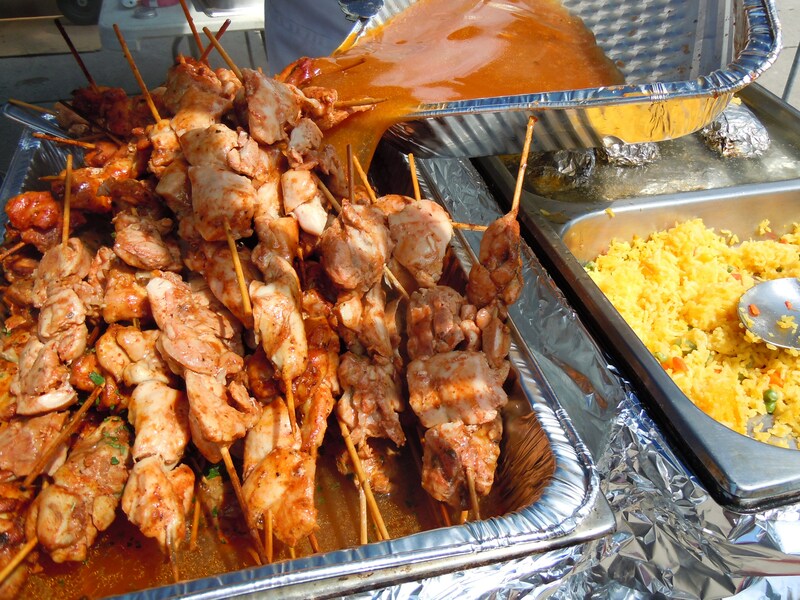 Summer, Sun, Music, Food: Whet Your Tastebuds for Tasty Thursdays at Nathan Phillips Square! Toronto may not be queen in the world’s palace of eats and it’s nearly impossible to clearly define what Toronto’s cuisine truly encompasses. However, I think the foodscape in this city is so fun and so full of opportunities for exploration, and the events that are put on throughout the year allow so many of us to enjoy food in all its shapes and forms. 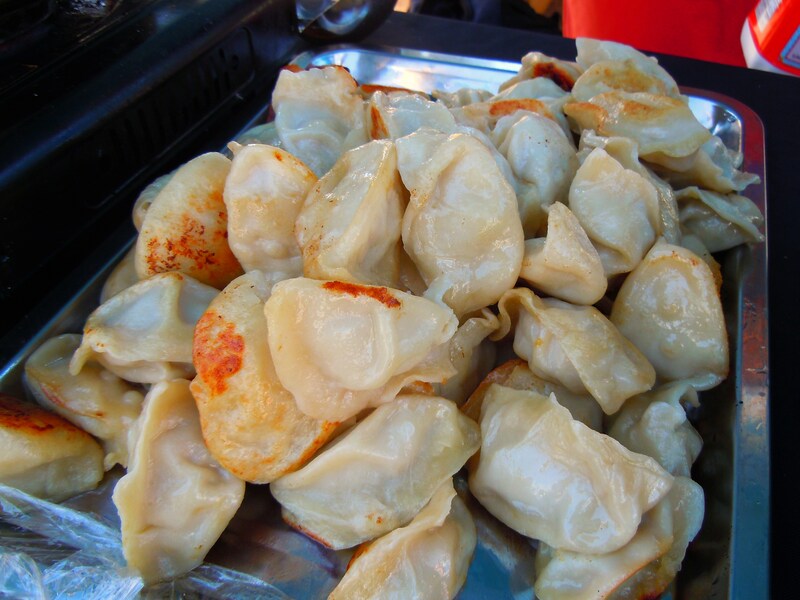 This Thursday on July 14th marks yet another summer fest of food at Nathan Phillips Square with Tasty Thursdays! 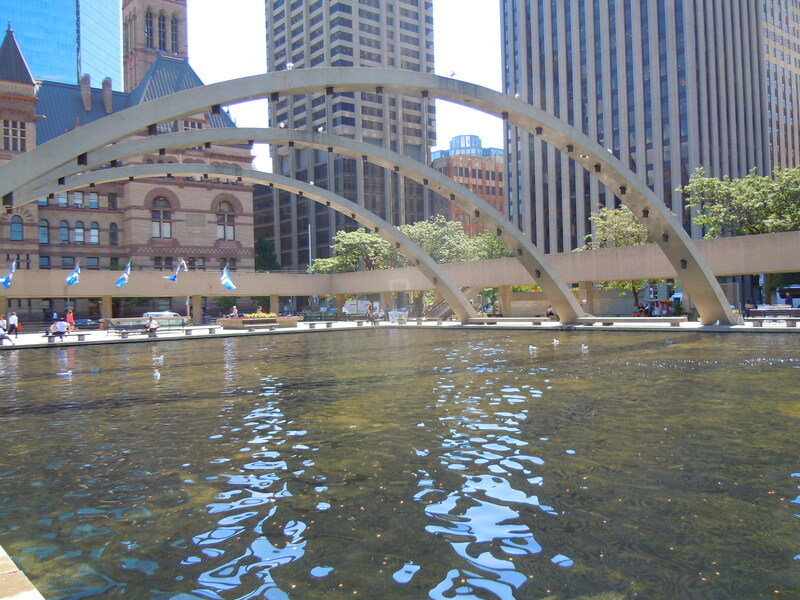 Nathan Phillips Square hosts two summer foodie events, one being the Fresh Wednesdays farmers’ market and the second being Tasty Thursdays, an outdoor bounty of food offerings from restaurants and eateries across the city. 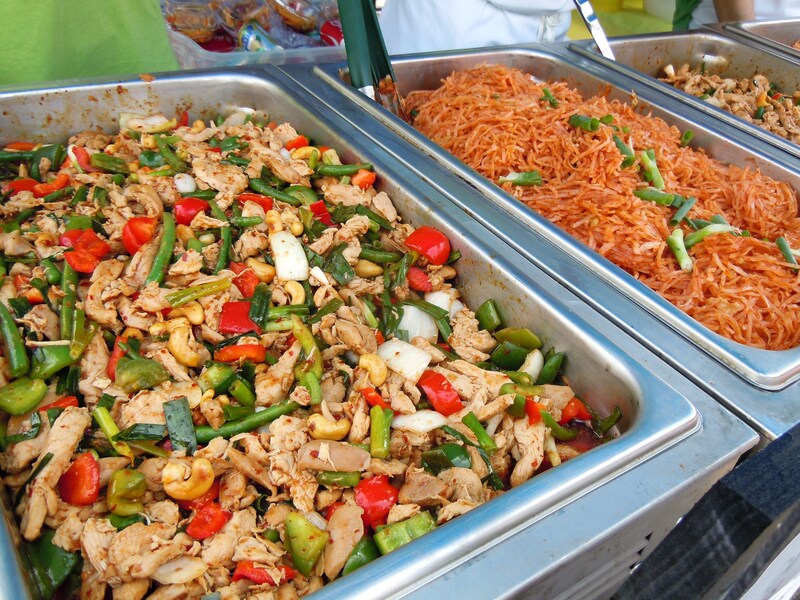 From 11am-2pm, these vendors offer everything from Thai to Caribbean and Jamaican, Tex Mex, Indian, and South American, with all food prices coming in at $7 or less. Even though I’m a bit crestfallen that the maximum used to be $5, I’m hoping that whatever rings in at $7 this summer will be well worth it. Prices aren’t flat rates so to speak, so you can purchase a lunch meal for $5, a snack for $2, or an appetizer for $3. 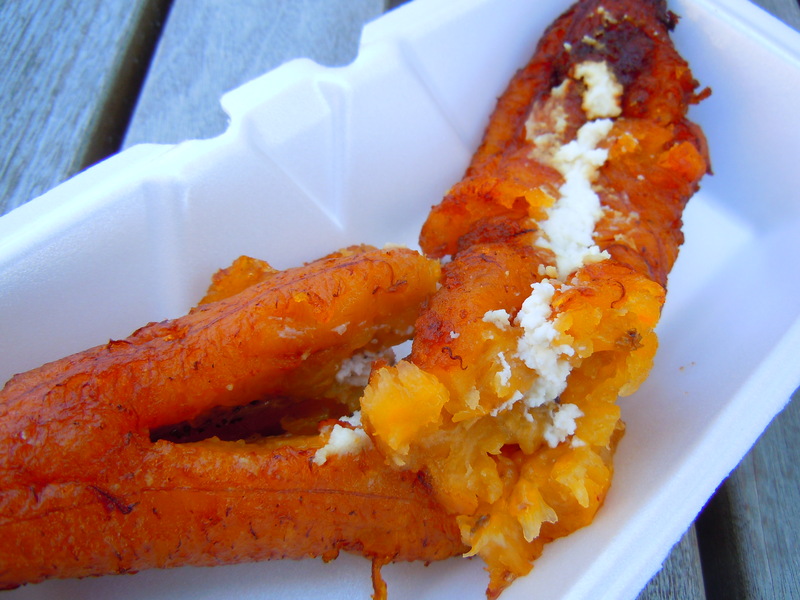 I went to Tasty Thursdays several times last summer and I tried a bunch of different things! 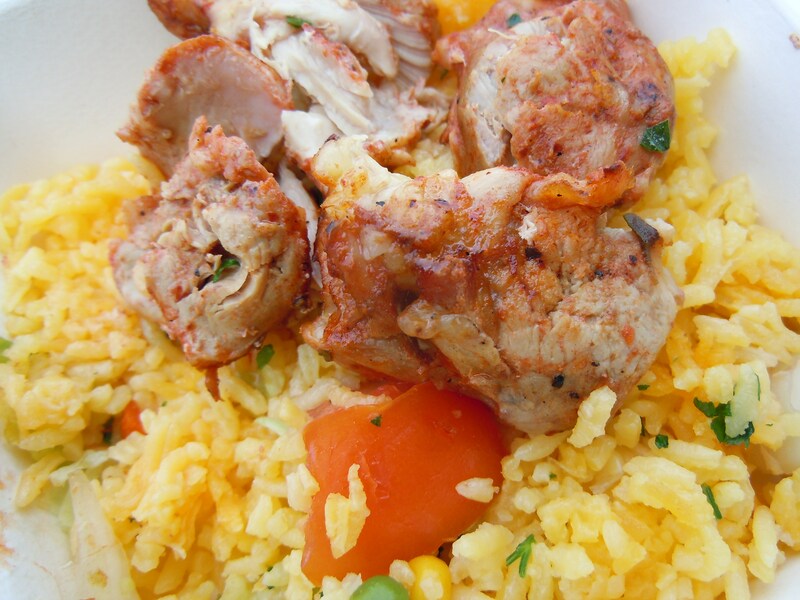 I remember eating noodles, blackened shrimp, ceviche, and my favourite, a Peruvian chicken and rice meal! 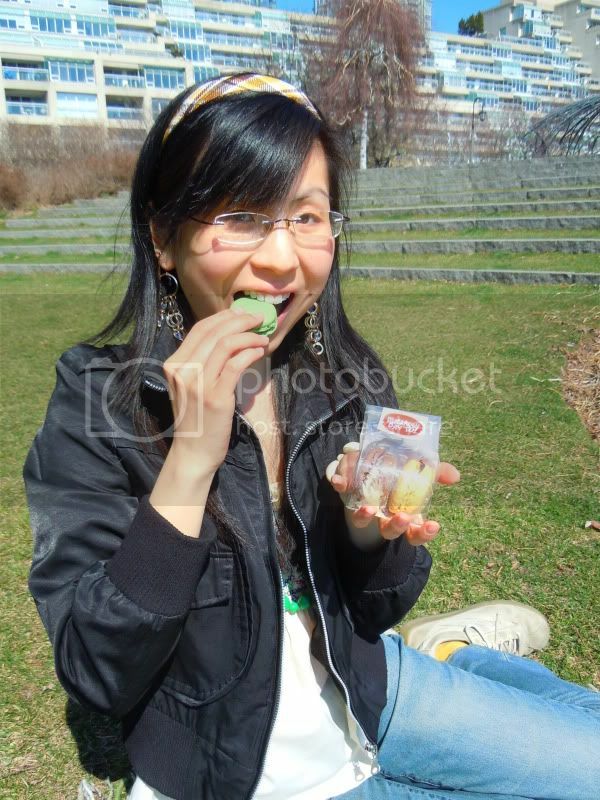 I was in love with the rice especially and I’d be so happy if they brought it back again this summer. If you’re a foodie like me (or, you know, if you’re just hungry), and if you haven’t been before, check it out this Thursday and every Thursday until September 1st. Great food with music to enjoy out in the summer sun. Here’s a sneak peek with some photos I took of the food last year!